There are three basic types of peripheral nerve injuries (PNI) commonly seen in the clinic. Stretch related- the peripheral nerves are elastic, but when a traction force is too strong injury occurs. If the Traction force is strong enough, a complete tear may occur, but most commonly the continuity is retained, resulting in injuries such as Erb's Palsy. Lacerations-Another common type of PNI are lacerations created by blades. those types of injuries might be complete transections- but most commonly some continuity remains. Compressions-The third type of PNI are compression These injuries include the Saturday Night palsy due to radial nerve compression as well as entrapment neuropathies and do not involve tearing of the neural elements. The most common of the three is stretch-related, followed by lacerations and compression. There are two commonly used classification for PNI- the Seddon classification and the Sunderland classification. ↑ 1.0 1.1 Burnett MG, Zager EL. 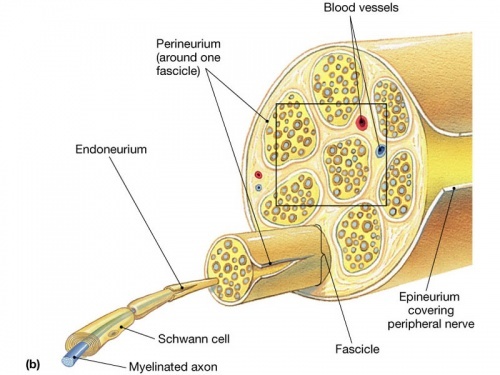 Pathophysiology of peripheral nerve injury: a brief review. Neurosurgical focus. 2004 May;16(5):1-7. ↑ 2.0 2.1 Campbell WW. 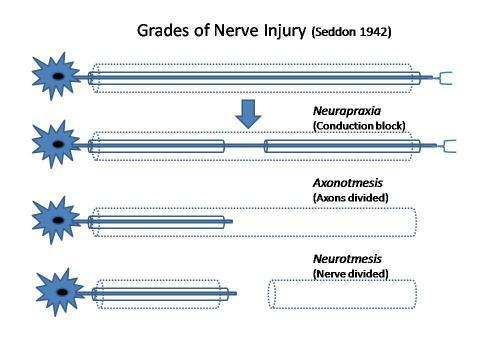 Evaluation and management of peripheral nerve injury. Clinical neurophysiology. 2008 Sep 30;119(9):1951-65. ↑ Lee SK, Wolfe SW. Peripheral nerve injury and repair. Journal of the American Academy of Orthopaedic Surgeons. 2000 Jul 1;8(4):243-52.